On Saturday night, after The Great New Zealand Crime Debate event at the Christchurch Writers Festival, we will find out who takes home the terrific hand-crafted art trophy designed and created by local sculptor Gina Ferguson (along with the winner's cheque - thanks to the Christchurch Writers Festival Trust - and collection of Ngaio Marsh novels - thanks to HarperCollins, Dame Ngaio's publisher). Before then, I thought it might be fun to take a closer look at each of the contenders - four books and authors. We kicked things off, alphabetically by author, with COLLECTING COOPER by Christchurch writer Paul Cleave, who won the 2011 Ngaio Marsh Award, and then LUTHER: THE CALLING by Wellington author Neil Cross, who is a three-time finalist, and then BY ANY MEANS by young Auckland crime writer Ben Sanders, a first-time finalist. 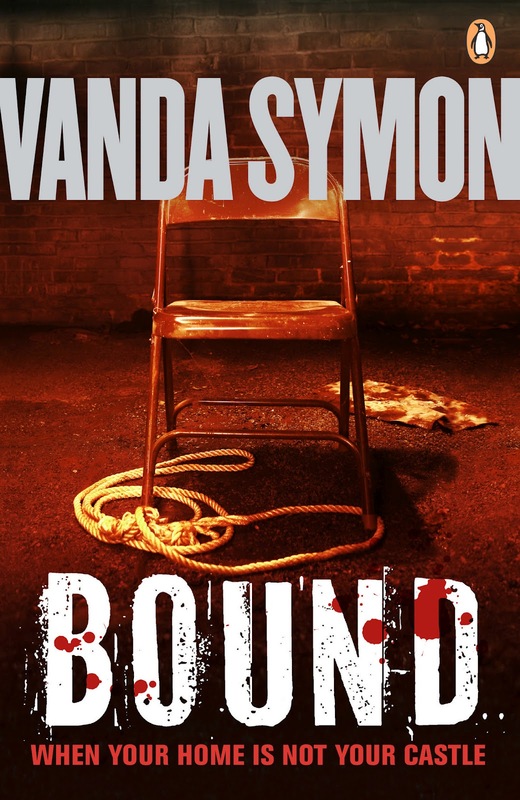 And now we come to the fourth book in the running - the terrific BOUND by Vanda Symon. The fourth book in Symon's acclaimed series starring young Dunedin police detective Sam Shephard, who has clawed her way up the police ladder, with varying degrees of success, from when she was a sole-charge rural cop in OVERKILL. BOUND sees Shephard caught up in a brutal home invasion investigation. BOUND is an exciting tale that grips you right from the helter skelter opening pages, and finds Shephard facing enormous pressures on both the professional and personal front. In an interview with the Weekend Herald in 2011, Symon said she thought literary characters, just like real life people, should be affected by all that has come before in their lives, that detectives should evolve over the course of a series, rather than staying static. That were affected by the events that happen during the course of each book. Symon certainly tests Shephard heavily in BOUND, throwing many challenging life events at her heroine, along with a tricky case that sees her pitted against some of her own colleagues. "I love writing about Sam, doing mean and nasty things to her," laughed Symon during the Weekend Herald interview. "She's great to hassle." In that same interview, Symon revealed that she originally had a male detective in mind for her Otago and Southland-set crime series, until a moment of realisation struck, and changed everything. "I can't even remember exactly what it was, but my husband did something completely daft, and I went, 'oh my God, I can't even understand my own husband, how could I get into the head of a male', so I changed it," she laughs. "And the moment I changed it to a female, Sam Shephard stepped up, fully-formed as a character, and it was like she attituded her way into my life." But what did the Ngaio Marsh Award judges think of BOUND? Well, they liked it too - with the expert panel consisting of crime fiction afficianados from the United Kingdom, Germany, the United States, and New Zealand, putting the book through from a tough and closely-contested longlist. Among other comments, the international judging panel rated BOUND as “full of surprises” and “the best yet” in Symon’s excellent Sam Shephard series, filled with “great pacing, characters, and dialogue”. But will it be enough for Symon to leave tomorrow night's event with the handcrafted art trophy, depicting her predecessor Dame Ngaio, in hand? We'll just have to wait and see. Have you read BOUND, or any of Vanda Symon's other terrific crime novels (the Sam Shephard series, or the standalone thriller THE FACELESS)? Does it sound like a book you'd like to try? Comments welcome.